Alternative pop sensation, Hannah Gill of the critically acclaimed independent New York band, Hannah Gill and the Hours has had an exceptional career as an independent artist, and it just keeps getting better and better as she progresses quicker and quicker towards alt pop superstardom. With a unique sound and exquisite style, elegant performances and a voice that commands full attention she has defied the world's expectations of indie artists and achieved success beyond what was previously thought possible by self-managed, self-distributed indie acts. She's toured internationally, toured the US several times, played at some of the most popular music venues and concert halls in the world, played several popular US music festivals and received critical acclaim for almost every single one of her records. 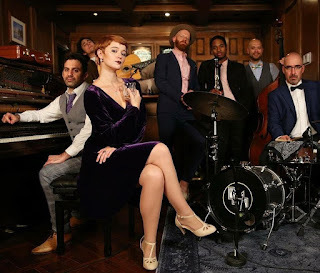 This month her 2018 winter tour with music collective, Postmodern Jukebox kicked off in North Bethesda, Maryland, USA on the 5th of November. The intensive 22 date tour includes venues in Virginia, Pennsylvania, Connecticut, New Jersey, Louisianna, Tennessee, Oklahoma, Arizona, Washington, Orlando and British Columbia in Canada, before coming to an end on the 8th of December in California. Concert dates, tickets and information are available on the Skunk Radio Live Events page.